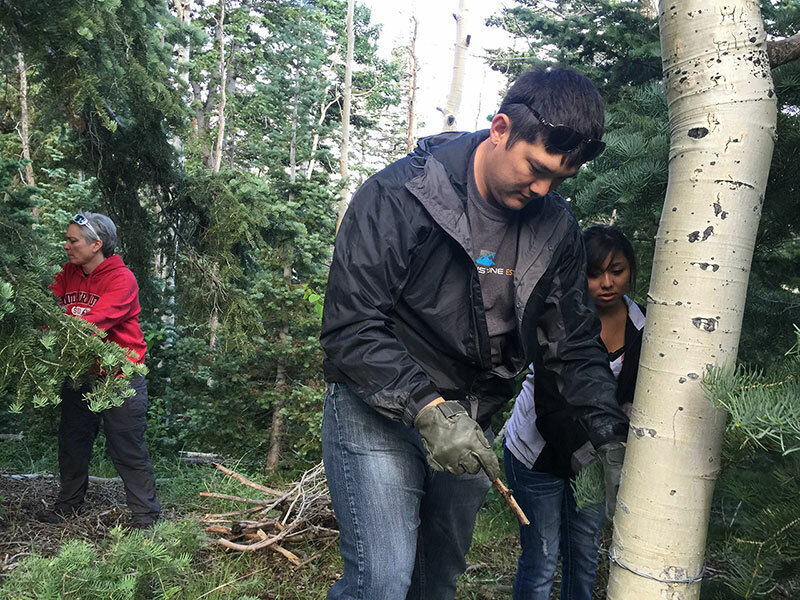 Setting up traps with sticky tape, pointed nails, and blanks of wood around the surrounding areas of Summit Mountain Lodge in Brain Head, Utah, Damaris Perez, a Southern Utah University senior biology major from Salt Lake City, Utah, hopes that her research will lead to a breakthrough in safe genetic sampling. Partnered up with Dr. Jacqueline Grant, SUU biology professor, the pair have begun a yearlong project to collect hair samples through noninvasive techniques, trekking up the mountain twice a month to collect samples in a way that has yet to be done in Utah for shrews, large cats and black bears. For more variety with species, Perez is setting up traps for the big cats also around Cedar City. Perez says that collecting the hair samples will allow for an accurate genetic analysis from the hair samples alone. “Before you’d need to trap and kill the animal to retrieve genetic samples but now we can get all sorts of information from just the hair samples while still trying protect the animal,” explains Perez. The safe collection of genetic samples is an emerging field and a whole lot hasn’t been done to protect the animals so Perez’s research could be a breakthrough is genetic science. Leaving food around the traps attracts animals to the trap and in an attempt to reach the food, the animals shuffle under the fencing and hairs attach to the tape. The tape is then collected by Grant and Perez to conduct genetic analysis. Along with genetic sampling the project provides an accurate inventory of animals in the area. “Do we have cougars, bobcats, coyotes, and foxes?” asks Grant and explains that the nailed traps collect the hairs when the big cats, like any cats, would rub across the nails of the trap. Grant and Perez are using catnip and jars of bobcat scent to lure the cats to the trap. Perez’s research project is funded by the Walter Maxwell Gibson Research Fellowship and the L.S. and Aline W. Skaggs Scholarship. The Gibson Research Fellowship pays Perez for her commitment to research while the Skaggs scholarship pays for her supplies required to conduct the research. “This definitely helps me focus on purely just the research and dedicate more of my time to it,” says Perez explaining that getting paid will allow her to work on her project more thoroughly. “Any undergraduate student can apply for this scholarships as long as they apply with a faculty advisor and present a research project that is centered on science,” explains Jackie Grant. The Gibson and Skaggs scholarship is a great opportunity for students within Southern Utah University's Walter Maxwell Gibson College of Science and Engineering that qualify. For Perez it could lead to a scientific breakthrough in genetic research.